There once were “alligators” in Southern Ontario. In fact, these Simcoe bred “alligators” roamed throughout Northern Ontario, Quebec, the northern US and even one in South America between 1889 and 1945. These extinct Simcoe bred alligators exist once again in the waters of the River Lynn. Around 1878, Mr. James Peachey and Mr. John C. West formed a partnerhship and began the West and Peachey Company in Simcoe. A very productive foundry, it provided the local farms with good quality farm implements and the logging industry with saw mill equipment. In 1887, Mr. Joseph Jackson, a one-time MP for Norfolk County, approached Mr. West with a problem. His logging company in the north country was finding the job of getting timber to the mills in the South more and more difficult as the timber crews had to go so far north. By 1889, West and Peachey came up with a prototype for a newly invented “Better Way” to deal with the problem. The town was a blur of excitement. Businesses were closed, schools were let out for the afternoon, reporters and tourists were everywhere. A hush went over the crowd as they took in the sight of this ungainly, awkward-looking scow-shaped boat that Mr. West and Mr. Peachey claimed could move along on land as well as in the water! The huge chimney began to belch out smoke, the whistle screamed and wailed, and the cable was secured to a “dead head” anchoring point several hundred yards away on the opposite side of the Lynn River. Much to the surprise and delight of all, when the engine was reversed and the cable drawn tight, with a sudden lurch the boat began to move down the road with incredible ease. When the boat got to the shore of the Lynn River, it didn’t stop at all. It just slowly and gracefully slid into the water, taking up its cable to the other side. The paddle wheels propelled the boat easily through the water. Dubbed the “alligator” because of its amphibious nature, the boat moved into full production as orders poured in. By 1894 there were alligators everywhere along the banks of the River Lynn, and the business helped the town flourish over the next few decades. Improvements to the tug over the next few years made the tug more maneuverable as well as faster on water. The Gator could hook onto a log “bag boom” often containing some 60,000 logs or more, and haul the whole huge pile of logs along the lake! Orders came from all over North America. Orders remained strong until 1937 when over 210 boats had been built. But by the late 1930’s the diesel engine was becoming more popular than steam power. Companies were building their own mills closer to the source and orders for the Alligator began a steady decline. The old tugs were hauled up on the beaches where their last work had been done, from the Gulf of St. Lawrence in Quebec across Northern Ontario to Manitoba and beyond. They were abandoned and left to rot where they lay. In 1991 “The Great Alligator Hunt” was launched by the Alligator Restoration Committee. An “alligator” was located near the town of Atikokan, Ontario, north of Thunder Bay. The Committee travelled to the site and made arrangements for the abandoned alligator to be returned to its hometown of Simcoe. A crew of local men travelled north to oversee lifting the vessel onto a float trailer for the 1700 kilometre trip. 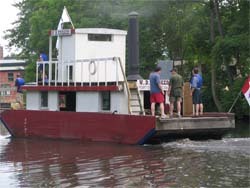 After years of painstaking restoration by dozens of dedicated volunteers, the W. D. Stalker “alligator tug” is now moored off the east bank of the Lynn River, south of the Argyle Street bridge, in Simcoe, Ontario.